This jack o’lantern may be smiling, but there’s something slightly menacing about it. Of course, that’s part of his appeal to collectors. Over seven inches in height, he’s made of a paper pulp product that was shaped by pressing into a mold and hardened. Then he was given a coat of bright orange paint, and a thin paper insert fills in the openings with his red/yellow eyes and nice straight teeth. There’s a hole in the bottom into which a candle could be inserted to light him up. Picture him with his eyes and teeth glowing. Pretty cool, right? 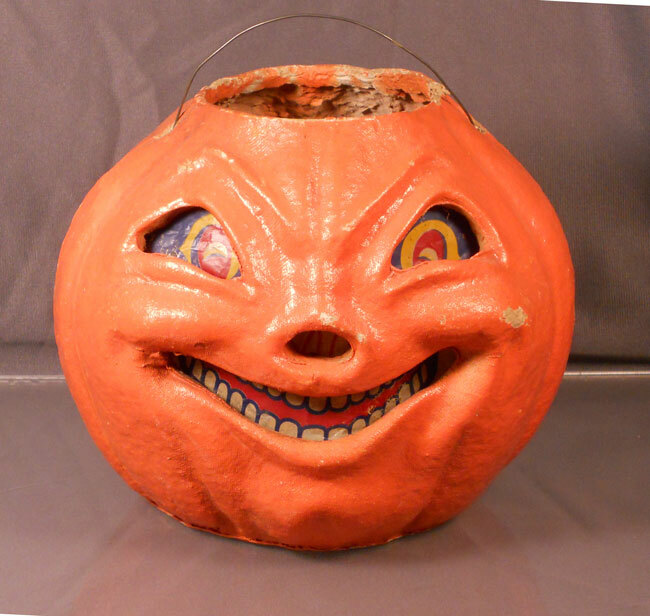 Of course, he’s made of completely flammable material, so you can imagine how safe putting a lighted candle inside of him was, but that’s how it was done “back in the day.” These American-made Halloween decorations date from the late 1930’s to the early 1950’s and are highly collectible. It’s very difficult to find them in good condition with their paper inserts intact. Have a safe and Happy Halloween! Best wishes from Collectorgene! This entry was posted in 1930's, 1940's, 1950's, Americana, Carol, Halloween, Holiday, Uncategorized, Weird. Bookmark the permalink.